Illinois Sen. Kirk and Maine Sen. Collins break with GOP on Obama Supreme Court nomination. 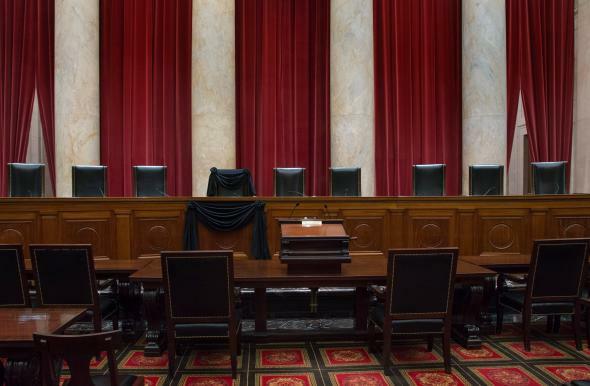 U.S. Supreme Court Associate Justice Antonin Scalia’s Bench Chair draped in black after his death on Feb. 15, 2016 in Washington, DC. … I recognize the right of the president, be it Republican or Democrat, to place before the Senate a nominee for the Supreme Court and I fully expect and look forward to President Barack Obama advancing a nominee for the Senate to consider. I also recognize my duty as a senator to either vote in support or opposition to that nominee following a fair and thorough hearing along with a complete and transparent release of all requested information. Collins, who is also considered a centrist member of the GOP caucus in the Senate, represents a state that is libertarian to the point of being downright ornery, making the latest surge in GOP support for not railroading the judicial nomination process—from zero Republicans to two Republicans—far from a bellwether indicating a strategic shift in the party’s thinking. A recent poll by the Pew Research Center, however, does show a majority of Americans believe the Senate, at the very least, should hold hearings on a potential Obama Supreme Court choice. The numbers from Pew found Democrats feel more strongly in favor (79 percent) of the Senate acting on an Obama nominee than Republicans are against it (66 percent). More importantly, a majority of independents (56 percent) think the nomination process should go forward while Obama is in the Oval Office.